The Mets are clearly making a move to improve at the catching situation. By the end of the winter meetings, the Mets could end up signing someone or making a big trade. Here are the reasons for and against each option bing discussed. Pros– Realmuto is arguably the best catcher in baseball. In 2018 he led all catchers in runs scored (74), hits (132), doubles (30), batting (.277), slugging (.484) and WAR (4.3). In his last three seasons, he has an OPS of .792 and his home run and RBI totals have increased each year. Considering that he had no other support in that lineup, his 2018 stats were particularly impressive. Defensively, he is well above average and threw out just under 40% of attempted runners in 2018. Going into his age 28 season, there are many reasons to be optimistic. He has two more seasons of team control, which the Marlins are taking advantage of. 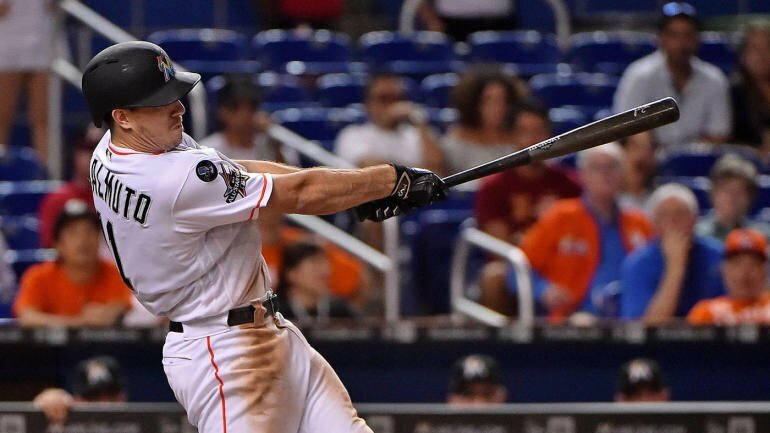 Cons– Realmuto won’t come cheap. The Marlins see him as their last great piece worth trading. So far, they have demanded two proven everyday players in a straight up deal with the Mets. Brandon Nimmo, Michael Conforto and Amed Rosario have all had their names thrown around. The other option is a three-way trade that would send Noah Syndergaard to the Bronx (something that makes every Mets fan cringe). As great as Realmuto is, the Mets can’t put all their eggs into one basket. Pros– The switch hitting Grandal is considered the best free agent catcher. Simply put, he is a winning player on a winning team. Grandal is a power hitter who has clubbed 22-27 blasts each of the last three seasons. In addition, he has a great batting eye. Despite his low career batting average of .240, he OBP is over 100 points higher. The Cuban native was considered a respectable defender… prior to the 2018 postseason. Cons– There are several red flags with Grandal. First, he turned down a qualifying offer. If the Mets sign him, it will cost them a second-round draft pick in 2019. If this doesn’t dissuade you, his defense may. Anyone who watched the playoffs knows that Grandal was less than smooth to put in nicely. Even if one wants to give him a free pass for his postseason performance, his regular season struggles can’t be ignored. On three separate occasions he led the majors in passed balls. Being that he recently turned 30, it is not clear how many more years he has behind the plate. Anything more than a few years is risky for an NL team. Pros– In terms of pure hitting ability, Ramos could be the best catcher on the market. It isn’t just that he hit .306 last season. In all but one season, Ramos batted .260 or higher. Additionally, he is almost always playing in pitcher’s parks. Over the course of his career, he has been an above average defender with a strong arm. If you ignore 2017, he is often well above the league average in throwing runners out. Cons– If only Ramos could stay healthy he would be one of the best. His 162 games average shows how good he can be. The problem is that he has a long history on the DL. This is why teams are reluctant to sign him. Ramos will turn 32 in August, so it is far from a safe bet to assume he can play catcher for much longer. Pros– Maldonado has largely flown under the radar most of his career. He spent six seasons in Milwaukee as a backup catcher. In 2017 he got the opportunity to be the everyday catcher with the Angels. He responded by hitting 14 homers and winning the gold glove. In 2017, Maldonado emerged as one of the best backstops. Cons– Maldonado weak offensively. His career OPS+ is a mere 73. He is a solid backup but is yet to justify his role as an everyday player. He has a slash line of .230/.303/.347 against lefties, which doesn’t really make him a good platoon guy. It is debatable if Maldonado would be much of an improvement over what the Mets currently have. Pros– As strange as this might sound, nothing isn’t inherently the worse thing. Travis d’Arnaud had a very good second half of 2017 when he slashed .264/.303/.440. Additionally, he put up a career high of 16 home runs on the season. Sadly, the 2018 injury prevented him from building off of this. Kevin Plawecki is an adequate backup. His .709 OPS over the last two seasons is fine. The Mets should also not rule out the possibility of bringing back Devin Mesoraco. He blasted 10 dingers and had an OPS of .715 in just 66 games. With Tomas Nido starting in AAA, it is not a great situation, but not the worst either. All you need if for one to have a breakout season. Do Plawecki and d’Arnaud have what it takes to contribute to the team? Cons– Mesoraco, Plawecki and d’Arnaud have each been the next big thing for way too long. All were first round picks, and all were busts. Mesoraco and d’Arnaud both suffered from chronic injuries but nevertheless have had limited success when on the field. If the Mets are serious about winning now, it is doubtful that they will go into 2019 with the same formula as 2018. Previous Should the Mets trade for or sign a catcher?